The Cathedral of Seville was once judged the third largest church in the world after Saint Peter's in Rome and Saint Paul's in London, it is now arguably the largest church in the world when compared using the measurement of volume. 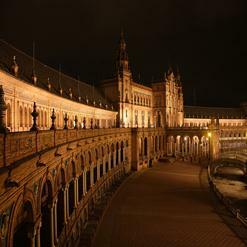 Seville's fifteenth century cathedral occupies the site of the former great mosque built in the late twelfth century. The central nave rises to an awesome 37 metres over a total area of 11,520 square metres.